This class originally came about because I was working on some class ideas inspired by the classic elementals – not in terms of “guy who uses fire”, but rather “class inspired by fire’s representation in folklore and mythology”. Some humanoids are born with an especially powerful spark of life. These are warrior souls, caught up in the great circle of life. Phoenixes have souls that never stop. When a phoenix dies, he or she immediately reincarnates as a new creature with the same memories and its personality mostly intact. The phoenix can do this many times, though each time stresses their constitution to the max, and each time a phoenix dies may be their last. Of course, it isn’t really the end of the phoenix’s soul – it merely transmigrates elsewhere in the cosmos (i.e. time for the player to roll up a new character) and fights on! The key ability of a phoenix is his ability to reincarnate upon death, per the druid spell of the same name. When a phoenix is reduced to 0 hit points, its body immediately bursts into a 10-ft. radius of fire which deals 1d6 points of damage per four levels of the phoenix. The phoenix has a chance to direct this flame at a single target; if they can pass a Will saving throw they can direct the fire up to a range of 10 feet per four levels at a single target, who suffers all the damage (Reflex save to halve damage). Once the fireworks are over, the phoenix emerges from the fire and smoke in a new body rolled randomly on the table below. Roll randomly for the gender of the new body. The phoenix gains all the abilities inherent to his new body (though not equipment, like a satyr’s pipes), but retains his normal hit points (adjusted for losing a level – see below), saving throws, attack bonus, ability scores and ability to speak. 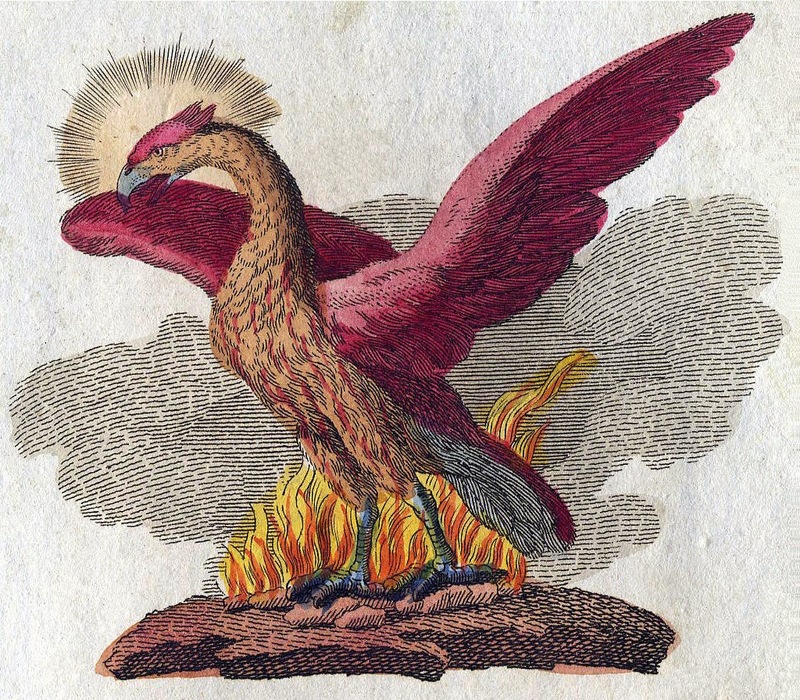 The phoenix personality remains largely the same, but is nudged a bit in the direction of its new form. 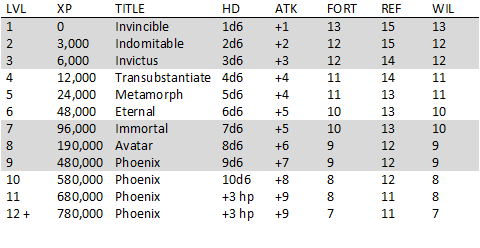 If the phoenix has half or less of the hit dice of his new form, his new form is reduced in size by one size category. The transformation is not without cost. The phoenix loses one level, and his experience points are reduced to the minimum level for his new level. A first level phoenix can reincarnate. His level remains at first, and his XP are reduced to 0. The phoenix must also pass a Fortitude saving throw or lose 1d3 points of constitution, permanently. Once the transformation is complete, the phoenix must adjust to their new body. Each round, the phoenix must attempt a Will save. Once they succeed, they gain control over their faculties and can act normally. Until then, they are stunned. A third level phoenix gains a limited form of regeneration. His natural healing is doubled (i.e. 2 hit points per level per night of rest), and he enjoys a +2 bonus to save vs. poison and disease. A sixth level phoenix gains access to his soul’s memories. By meditating for one hour, the phoenix gains the use of one feat per three levels (i.e. two feats at sixth level, three a ninth, etc.). The phoenix can only access memories in this way once per day. A ninth level phoenix can build a fortress-temple dedicated to the Phoenix. The phoenix attracts a body of 1d12+9 men-at-arms, heavy infantry, to serve as his personal bodyguard. In addition, a young 1st level phoenix seeks him out as a master (likely a sidekick from a former life). For some reason I can't get Dr Who out of my head afer reading this class. If you “multi-classed” this with the traveler class I did a while back, you'd have something that resembled the Doctor.